Robert Thomson, formerly from the University of Pretoria and now at the University of Turku, Finland, is investigating the interactions between Sociable Weavers and the world's smallest bird of prey, the Pygmy Falcon. His study site is Tswalu Kalahari, in the Northern Cape, South Africa, one of the De Beers Diamond Route properties. In the course of his field work (Sep - Dec 2011), he documented an amazing total of 159 Sociable Weaver colonies, and he counted a total of 8119 nest chambers! This is one of largest intensive surveys undertaken on this species. The number of nest chambers per colony at Tswalu are given by these stats: 1 - 52.0 (+- 40.1) - 181 (n=156), which reveal some interesting facets. Three nest masses consisted simply of 1 chamber (VM 2084, VM 2120, VM 2174). The largest colony in this survey contained 181 chambers (VM 2163). A mere three colonies did not have chamber counts: VM 2172 was being raided by a cobra!, VM 2089 was visited at night, and VM 2213 had a Spotted Eagle Owl nest on top, with 2 chicks (chambers not counted to reduce disturbance). To see all Robert's records see here - browse the tumb-nails to view the variety of nest shapes and sizes; zoom in on the map to see the spatial distribution of colonies. 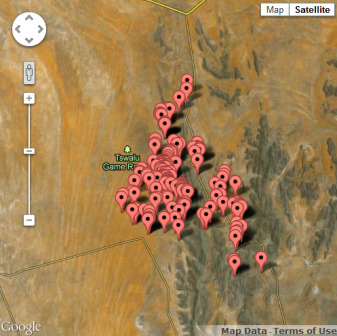 Click on any thumb-nail or map marker to see full details of a particular colony. If there are too many thumb-nails for you, see some of the more interesting colonies under Photo of the Week which lists interesting PHOWN photos with a comment on why it is of interest. To read more about Roberts project see a trip report here. 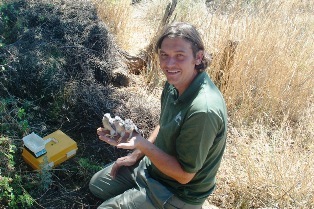 Photo (above): Robert with 3 Pygmy Falcon chicks from Sociable Weaver colony (VM 2104).